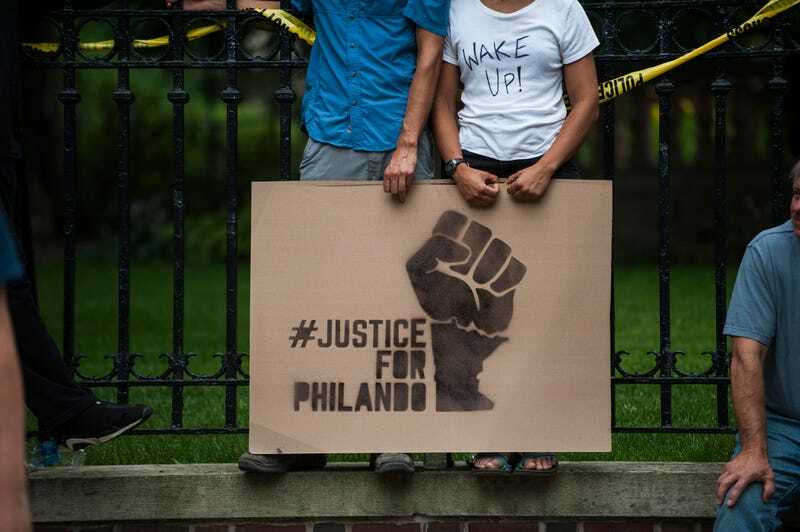 A couple hold a sign, protesting the police killing of Philando Castile, outside the governor’s mansion July 7, 2016, in St. Paul, Minn. Castile was shot and killed the previous night by a police officer in Falcon Heights, Minn.
Police officers arrested 46 people outside the governor's mansion in St. Paul, Minn., where a demonstration was being held Tuesday in response to the recent fatal police shooting of Philando Castile. Then, early Wednesday morning, another 23 protesters were arrested on charges of public nuisance and unlawful assembly, CBS News reports. Since July 7, the day after Castile's death, crowds of demonstrators have been camping outside the governor's home in protest. Police told protesters that they needed to move because they were blocking the street in front of the mansion. The request appeared to be unsuccessful, however, as the demonstrators stood in solidarity and the officers reacted with a more forceful approach. Police began responding at 7:15 a.m. Tuesday when demonstrators were found sleeping on the street. Despite the commotion occurring outside the home of the governor, officials said that he had nothing to do with the decision to clear the demonstration off the street. The governor has said that the protesters were welcome to stay as long as they wanted, according to CBS. This was also not the first time officers had cleared the street in front of the mansion. A few days prior, on July 18, the street was cleared, but people returned Sunday to continue their demonstration.